Tunisian civil society groups won the Nobel Peace Prize today (9 October) for helping to create the only democracy to emerge from the Arab Spring, at a time when the country is under threat from Islamist violence. The Nobel panel said the award to the National Dialogue Quartet was intended as an “encouragement to the Tunisian people” and as an inspiration for others, particularly in the troubled Middle East. 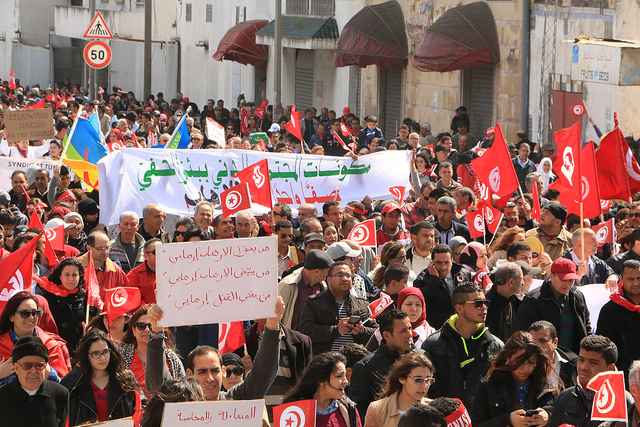 Judges hailed its “decisive contribution to the building of a pluralistic democracy in Tunisia in the wake of the Jasmine Revolution of 2011,” chairwoman Kaci Kullmann Five said. “The Norwegian Nobel Committee hopes that this year’s prize will contribute towards safeguarding democracy in Tunisia and be an inspiration to all those who seek to promote peace and democracy in the Middle East, North Africa and the rest of the world,” it said. And European Union foreign policy chief Federica Mogherini said on Twitter that the award “shows the way out of the crises in the region: national unity and democracy”. The Quartet was formed in 2013 when the process of democratisation was in danger of collapsing because of widespread social unrest, “establishing an alternative, peaceful political process” at a time when Tunisia was on the brink of civil war, Kullmann Five said. It is made up of the Tunisian General Labour Union, the Tunisian Confederation of Industry, Trade and Handicrafts, the Tunisian Human Rights League, and the Tunisian Order of Lawyers. “The Quartet exercised its role as a mediator and driving force to advance peaceful democratic development in Tunisia with great moral authority,” the Nobel panel said. Since the Tunisia uprising that began in December 2010, the Arab world has been rocked by massive upheaval has toppled leaders in Egypt, Libya and Yemen and plunged Syria into a brutal civil war. Tunisia has won praise for its political transition which has involved the adoption of a constitution in January 2014 and the holding of its first democratic elections at the end of the year. But its fledgling democracy remains fragile. Tunisia has faced a spate of extremist attacks in 2015, including a massacre at a Tunis museum in March that killed 22 people, mostly tourists, and a mass killing at a beach resort last month that left 38 foreigners dead. Both were claimed by the Islamic State group. It is the second time a Nobel peace honour has been bestowed in connection with the Arab Spring after Tawakkol Karman, an activist fighting Yemen’s regime, shared the 2011 prize with Liberian President Ellen Johnson Sirleaf and Liberian “peace warrior” Leymah Gbowee for their struggle for women’s rights and empowerment. The prize is a gold medal, a diploma and a cheque for eight million Swedish kronor (around 860,000 euros/$950,000) to be shared by the laureates. They will receive their prizes at a ceremony in Oslo on 10 December, the anniversary of the 1896 death of prize creator Alfred Nobel, a Swedish philanthropist and scientist. Last year, Pakistan’s Malala Yousafzai, who was 17 at the time, became the youngest-ever winner of the Nobel Peace Prize in an award shared with India’s Kailash Satyarthi for their struggle against the suppression of children and their right to education. News media reported on the evening of 9 October 2015 of conferment of Nobel Peace Prize 2015 on Tunisian group of civil workers, Quartet. Readers may like to know that this global distinction for Tunisia was predicted by this Vedic astrology writer in early 2015 through “ Outlook for Tunisia in 2015 – a Vedic astrology view”. The prediction which was televised by Meghrab 24 TV Channel in early beginning of 2015 , could be 7 March 2015 , spoke about golden opportunity for Tunisia towards end of September 2015. It is obvious that a decision in favor of Tunisia may have taken a turn by the end of September 2015 in the Committee’s deliberations , proving the accuracy of prediction of this writer.